You will love the functionality and quality of this 5pc Pasta / Salad set features a large bowl (approximately 5 quarts) and 4 pasta/salad plates. The plates are 9" in diameter and approximately 1 1/2" deep. The glaze on this fine stoneware collection features a unique color - a soft yellow hue with black speckles and a hand painted black rim. 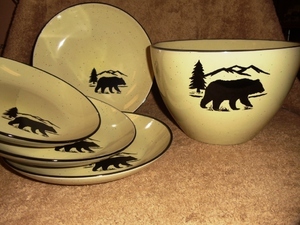 This unique color combination was designed to take advantage of the Bear and Mountain Silhouette painting by Dann Jacobus. Decorated by hand in the U.S.A. Product is Dishwasher, Oven and Microwave Safe.